This doctoral research aims to develop the ongoing understanding of narrative game mechanics and establish its presence within interactive fiction. 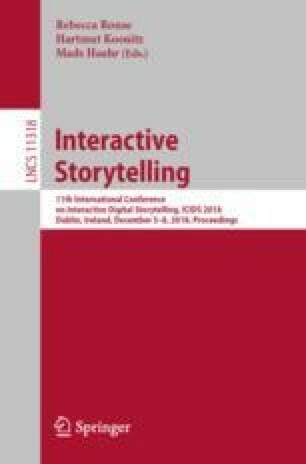 Research to define and understand the narrative effects of game mechanics is a current topic of academic debate [4, 5, 6, 7] and relates to the question of ‘how do games tell stories’ . Building on this work from key researchers [4, 5, 6, 7, 8], this study aims to carry out several textual analyses to identify potential narrative producing game mechanics. In addition, an interactive fiction game using the platform Twine has been created. Feedback will be collected from the Twine game and used to enhance further iterations of it. As part of the study an analytical structure has been developed which has drawn upon several theoretical approaches [14, 15, 16, 17, 18, 19, 20, 21]. This framework, in its preliminary stages, has four levels: Actions, Aesthetics, Mechanics and Narration to identify and analyze potential narrative game mechanics present within interactive fiction. Currently, two textual analyses have been carried out and these have been supplemented with Youtube ‘Let’s Play’ videos. The first and second versions of the interactive fiction game have been launched and feedback gathered. Preliminary conclusions indicate that narrative game mechanics require further defining. The information mechanic identified as part of this study, and its relationship to how it progresses a narrative, requires further examination. The framework designed has also shown the potential to be applied to both interactive fiction and video games.